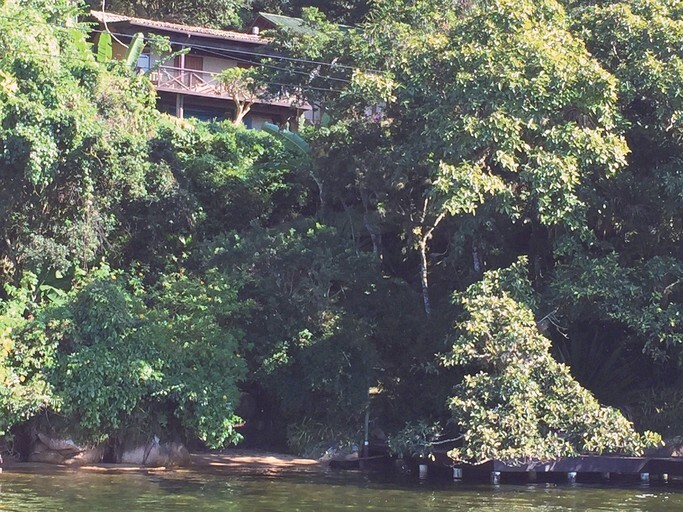 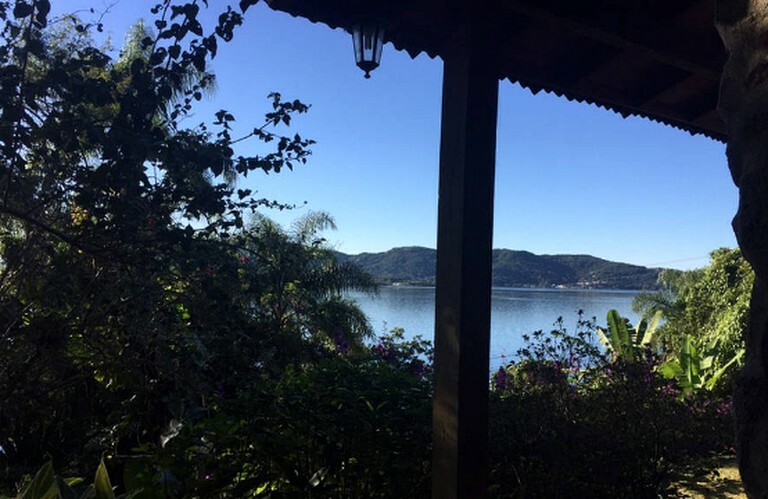 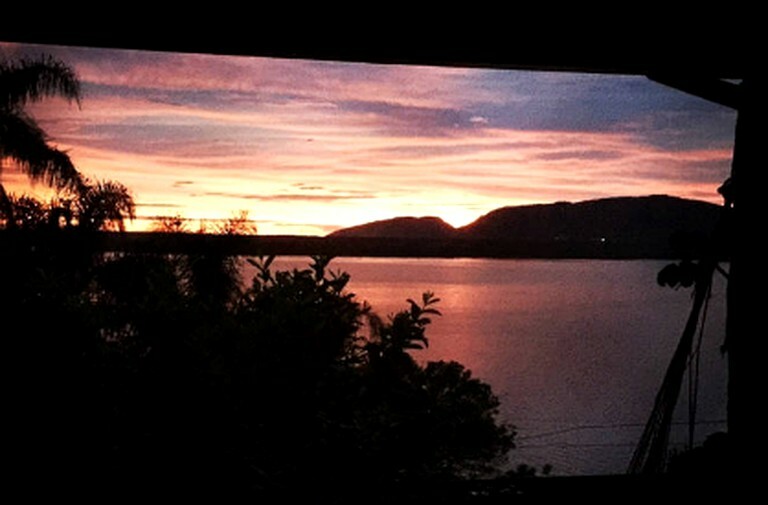 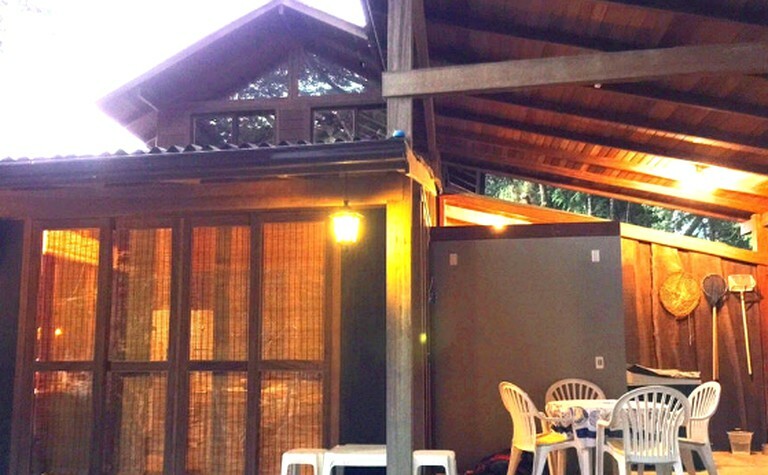 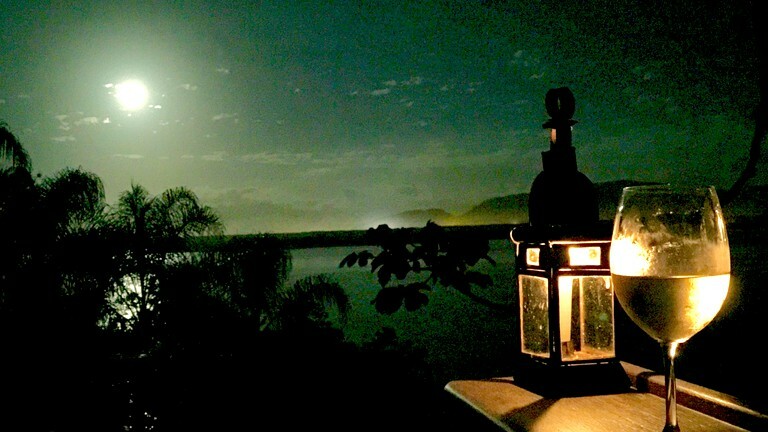 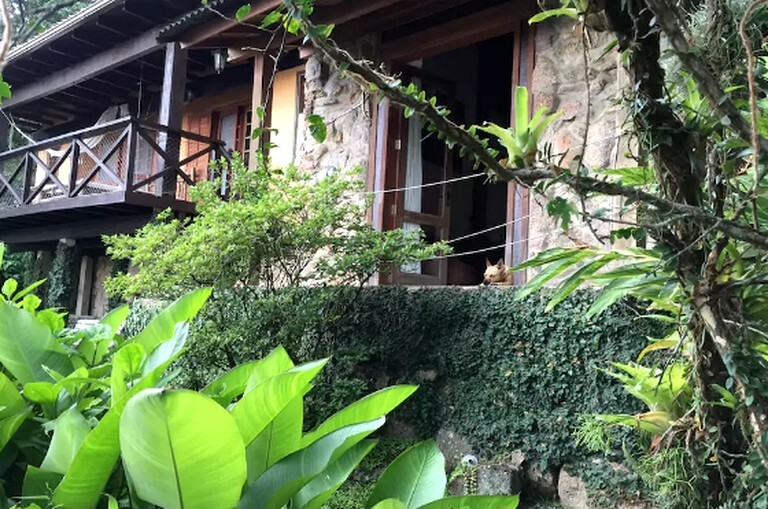 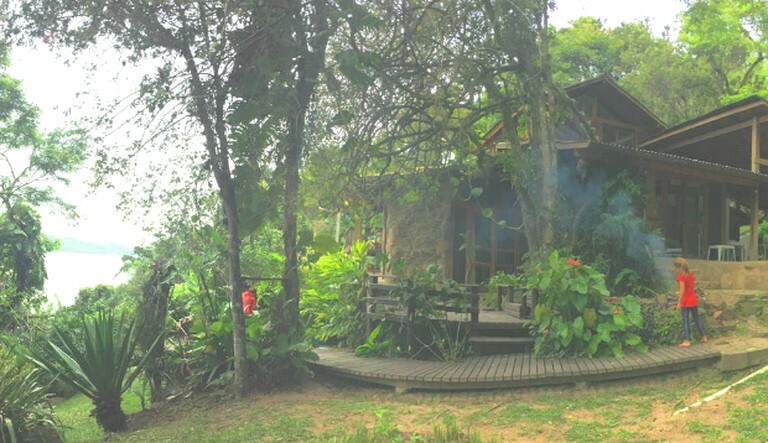 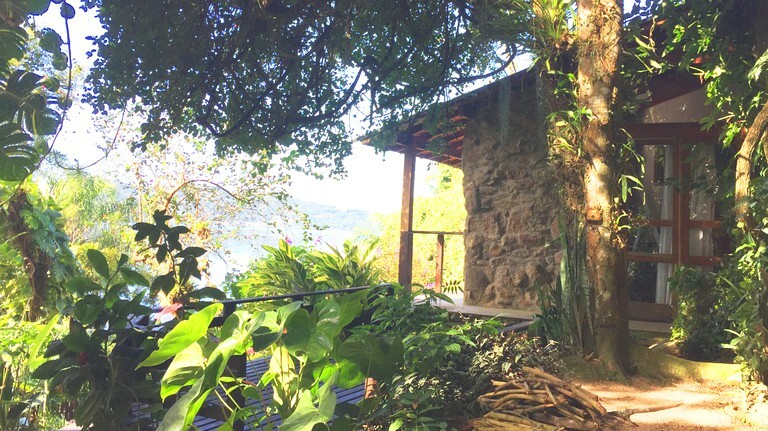 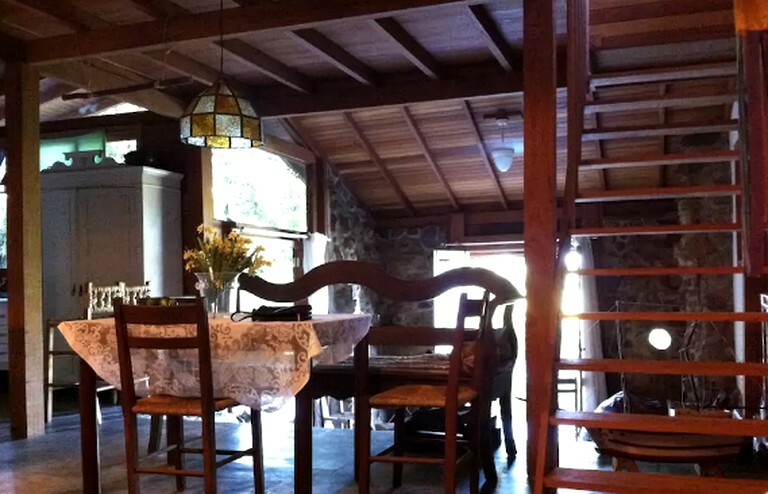 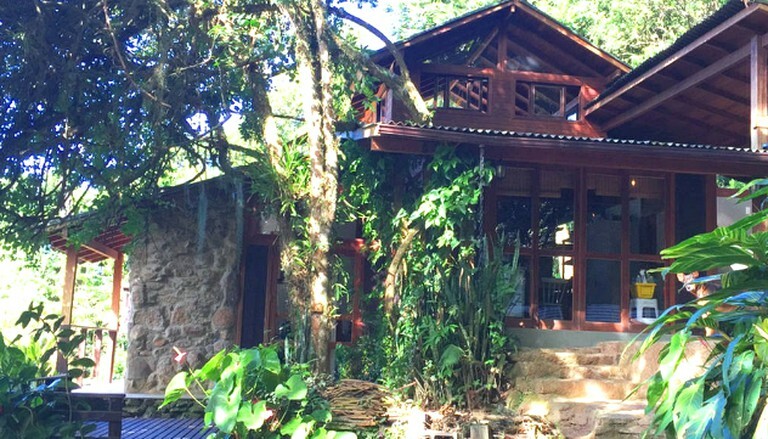 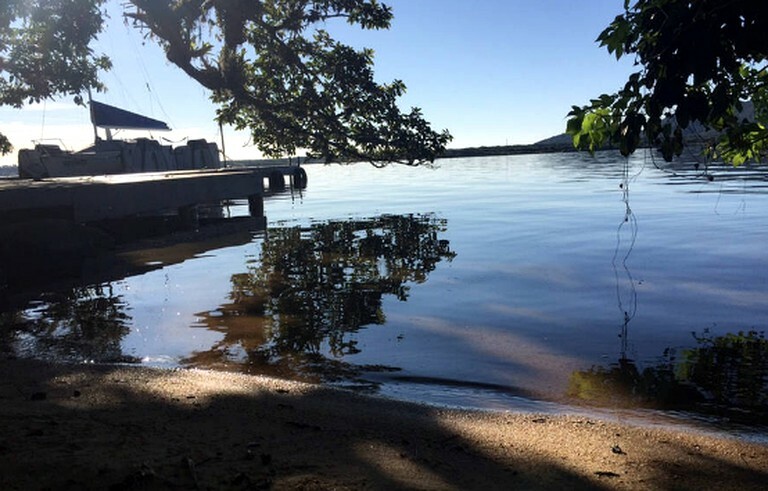 This stunning lakeside cottage rental sits on the beachfront of the Conceição Lagoon, which is just a 25-minute drive from the city of Florianópolis and is completely integrated with the exotic natural beauty of the lagoon’s coast. 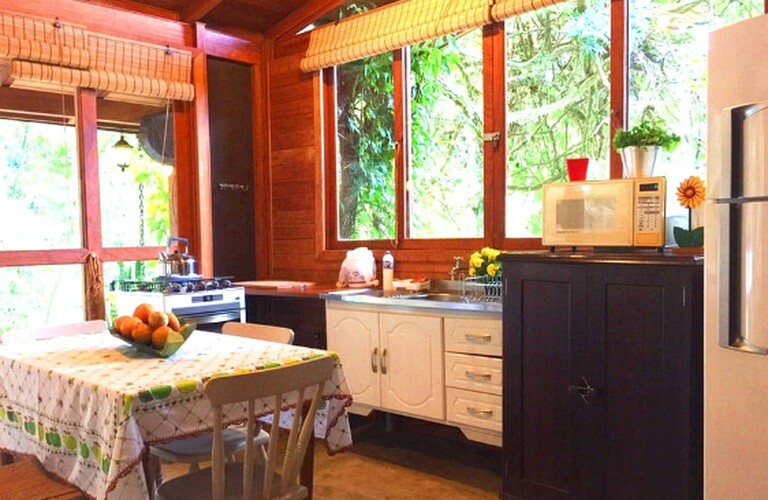 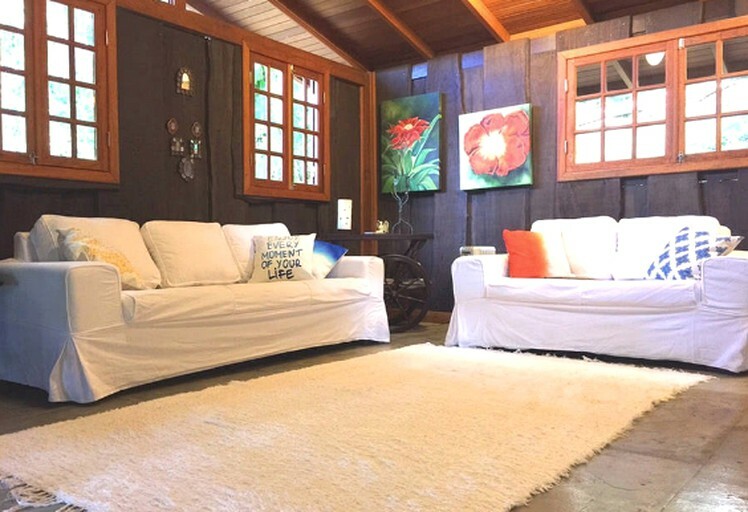 It makes for an unforgettable paradise vacation rental for friends or families who want to unwind on white sandy beaches and explore the rolling hills of Santa Catarina. 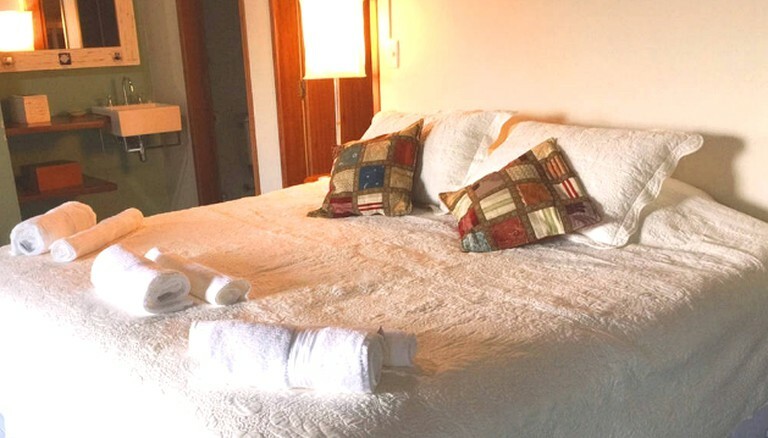 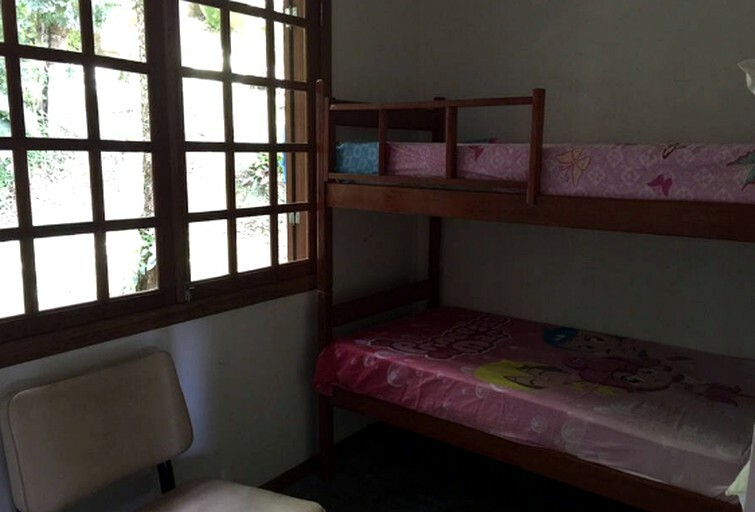 The cottage can accommodate up to six guests in its three bedrooms with one bedroom coming with a double bed, one with a double bunk bed, and the other with a double bed and a single. 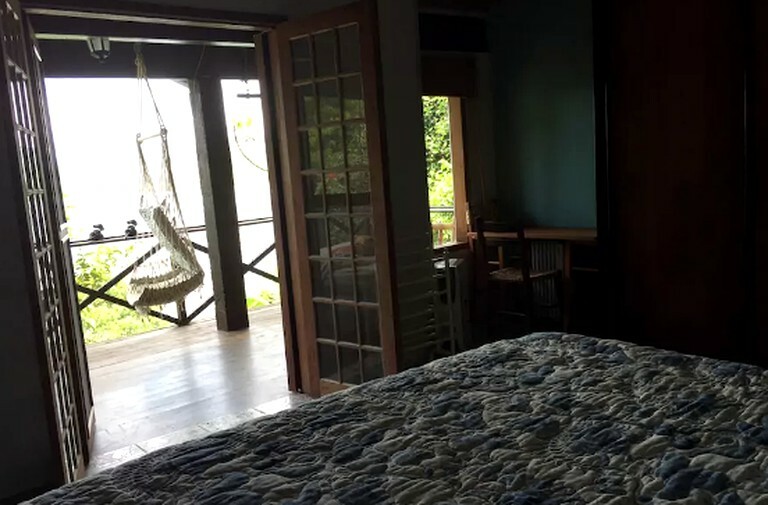 All the bedrooms include linens and towels as well as breathtaking views of the lagoon with access to the deck where guests can lay down on the hammock or sit back in the chairs and listen to the soothing sounds of nature. 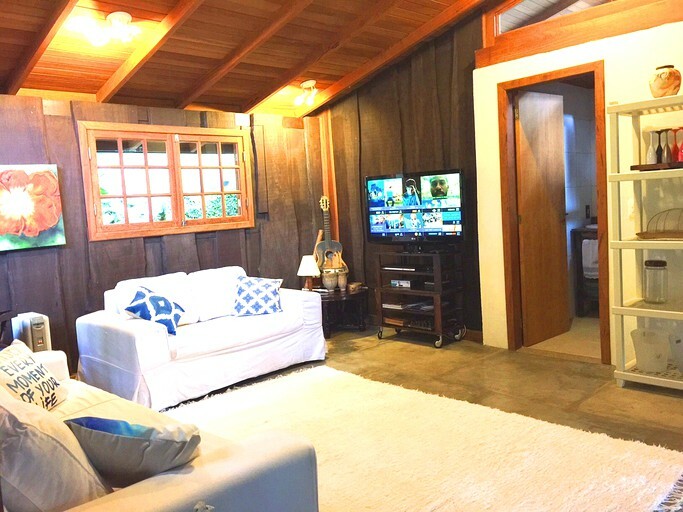 The living area is decorated with local artwork and wood panel walls and features comfortable sofas, a television, and a cozy rug, which makes it a fun place to hang out in the evenings to enjoy a movie night in. 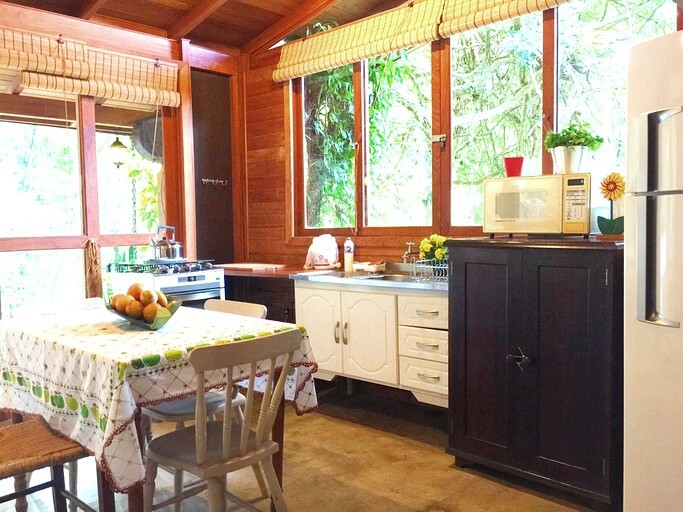 The kitchen is fully equipped with an oven, a stove, a microwave, and a refrigerator as well as plenty of storage room and large windows that offer views of the distant hills. 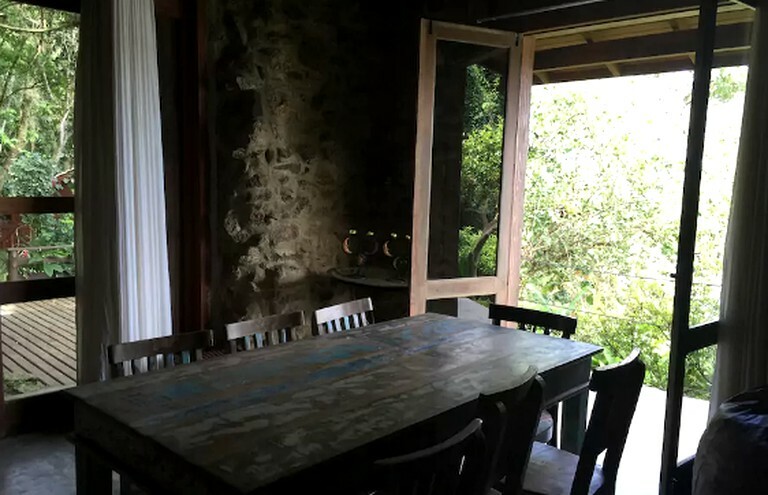 The rustic, stone walls of the dining room integrate large windows that open up for access to the deck while eight guests can enjoy sociable mealtimes around the wooden dining table. 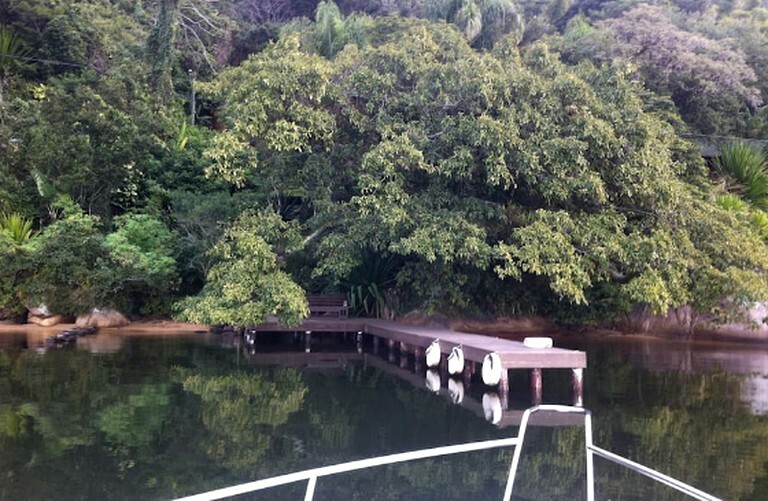 The property comes with a private boat dock on the lagoon as well as a wraparound deck where guests can sit back and listen to the soothing sounds of nature or take in the breathtaking views of the sunset over the hills with a glass of wine. 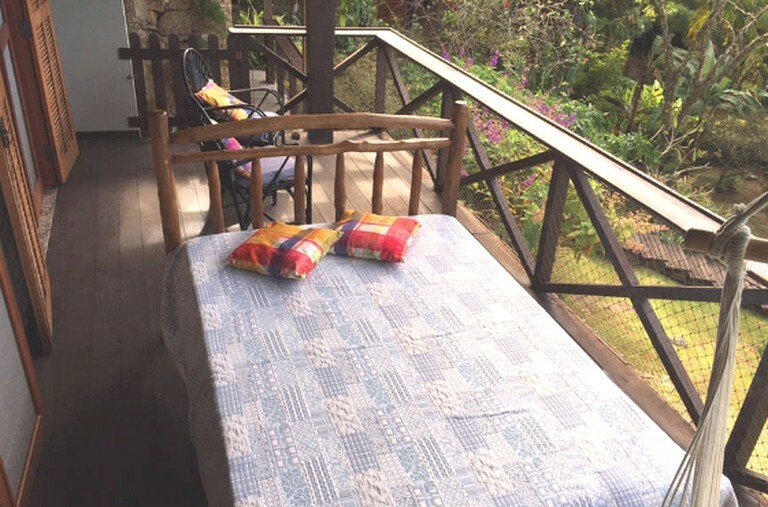 Guests have access to two verandas that feature comfortable seating, a hammock, a bed should guests wish to sleep in the fresh breeze. 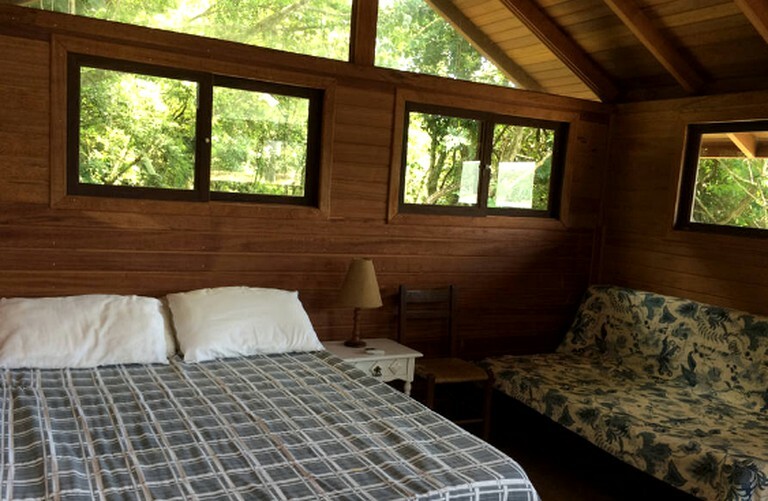 The rental comes with air conditioning and free Wi-Fi as well as a washing machine and a dryer for clothes. 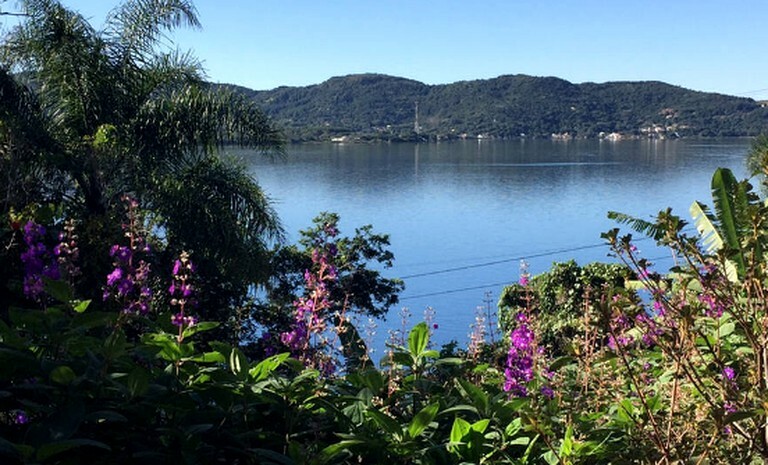 Florianópolis is home to 60 white, sandy beaches where many are considered surfing meccas including the Praia dos Ingleses and the Playa da Joaquina. 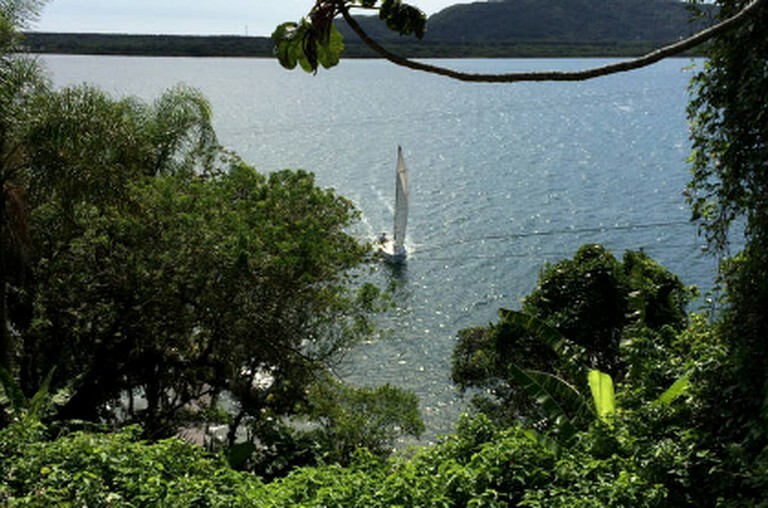 Guests can rejuvenate mind, body, and soul by taking in the sun before cooling off in the clear waters by swimming, surfing, or wind surfing. 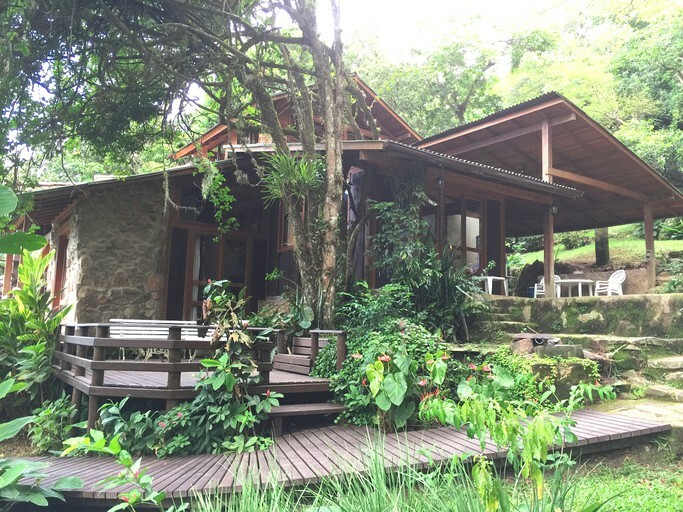 Guests with children should head out to the Agua Show Park as it is packed with fun activities and amusements for all ages and those looking for an insight into the area’s arts culture can visit the Santa Catarina Art Museum, which boasts one of Brazil’s finest collection of fine arts. 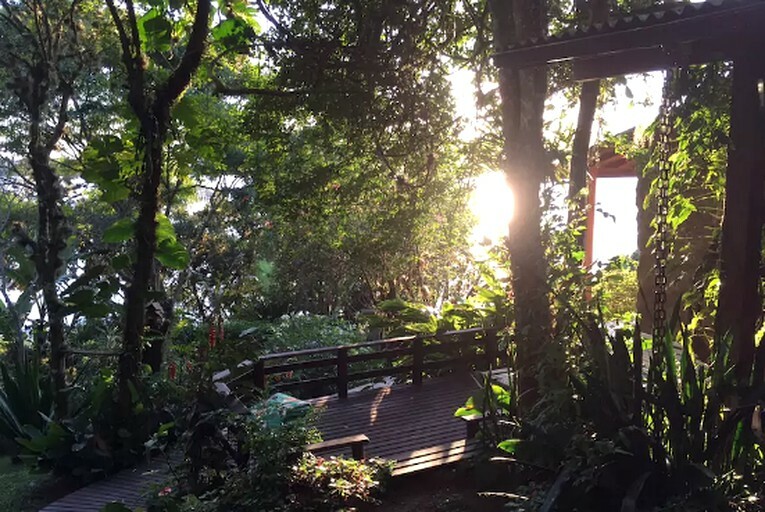 On the property itself, guests can take a short walk along the private wooden walkway to a boat dock and head out onto Conceição Lagoon either by kayak or sailing boat. 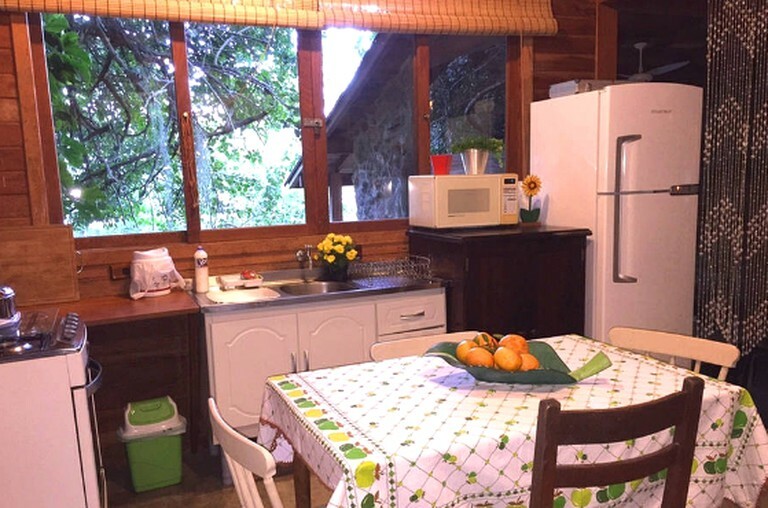 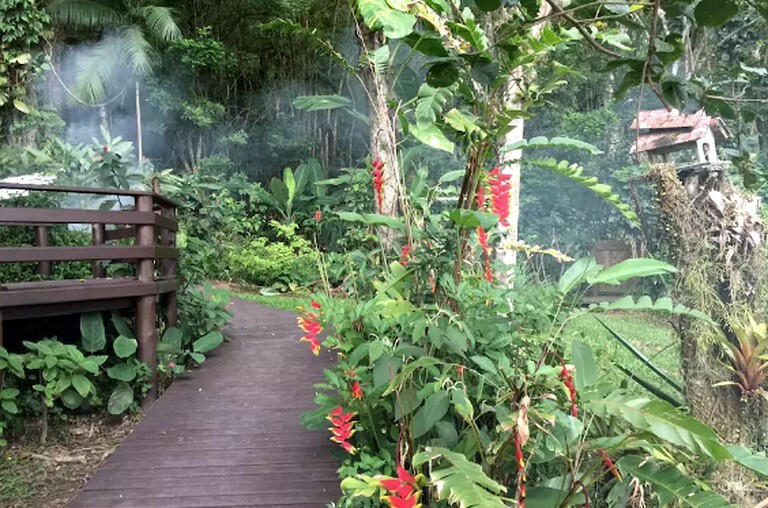 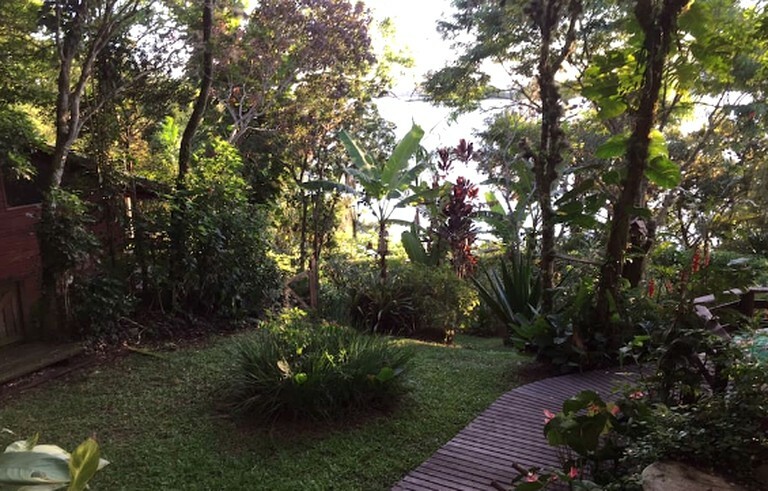 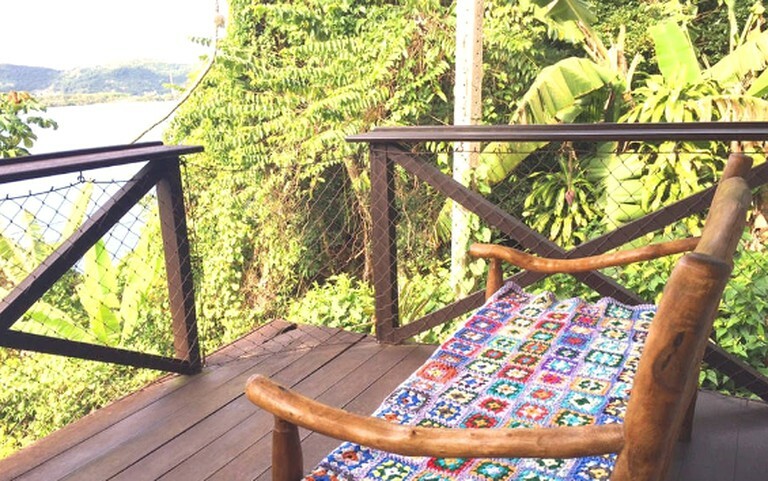 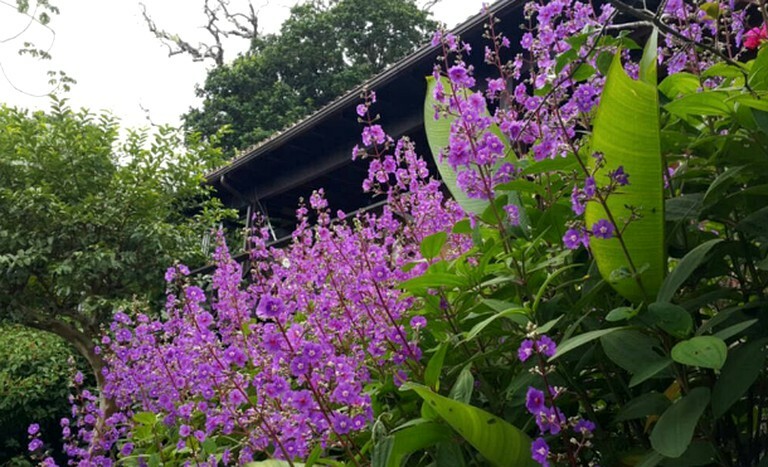 The rental is just steps away from the nature trail of Costa da Lagoa where visitors pass by exotic plant and animal life as well as waterfalls and paradise beaches.